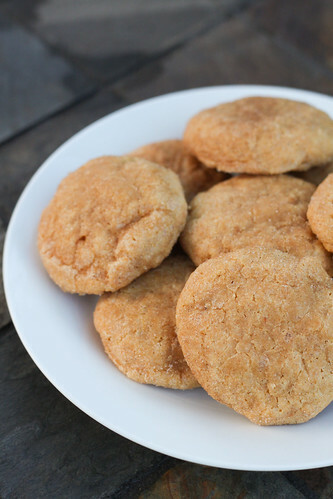 Another cookie that’s pretty addictive are these pumpkin snickerdoodles. I seriously ate 3-4 of these right out of the oven. They’re slightly crunchy on the outside (from the coating) and perfectly chewy on the inside. The flavor is wonderful…even my pumpkin hating husband loved these! By the way, this weekend I’ll make the quick drive to New Orleans for PMA Fresh Summit! I’ll be tweeting and Instagramming like crazy, so feel free to follow me on Twitter & on Instagram :-). In a medium-sized bowl, add the flour, baking powder, salt, cinnamon and nutmeg. Whisk to combine. In the bowl of an electric mixer, fitted with the paddle attachment, add the butter and sugars, and beat them on medium-high speed for 2-3 minutes, until light and fluffy. Scrape the bowl down with a spatula, and then mix in the pumpkin puree. Mix in the egg and vanilla extract until incorporated into the batter. Scrape down the bowl with a spatula again, and then with the mixer on low speed, add in the dry ingredients and mix until just mixed. Cover the bowl and chill the dough for at least an hour. Preheat the oven to 350 degrees. Prepare baking sheets by lining them with silicone baking mats or parchment paper. In a small bowl, add sugar and spices for the cookie coating and mix well. Scoop the dough with a cookie scoop and roll it into a ball. Place the ball in the coating mixture, and roll to completely coat the dough. Place on the cookie sheet and repeat with the cookie dough, leaving 2-3 inches space between each cookie dough ball. Gently press the cookies down with your hands to flatten the dough slightly. Bake the cookies in the preheated oven for 10-12 minutes, or until the cookies are just set and baked all the way through. Allow the cookies to cool on the baking sheets for about 5 minutes, and then transfer them to a wire cooling rack to finish cooling. Repeat with the rest of the dough, until all of the cookies are done. Enjoy! For some reason I never thought of pumpkin in snickerdoodles. Sure sounds like it would be delish! It’s definitely worth a try. I’m sad I waited this long! Yum! Perfect for fall! They look amazing!!! Thanks so much! 🙂 I love this time of the year…pumpkin everything! These are the cutest things I’ve ever laid my eyes on! Thanks so much! They’re so tasty!